The white interlace motif on this tile creates a pattern of diamonds centered on an eight-pointed star in green and yellow. Strong color contrasts make the tile visually striking. 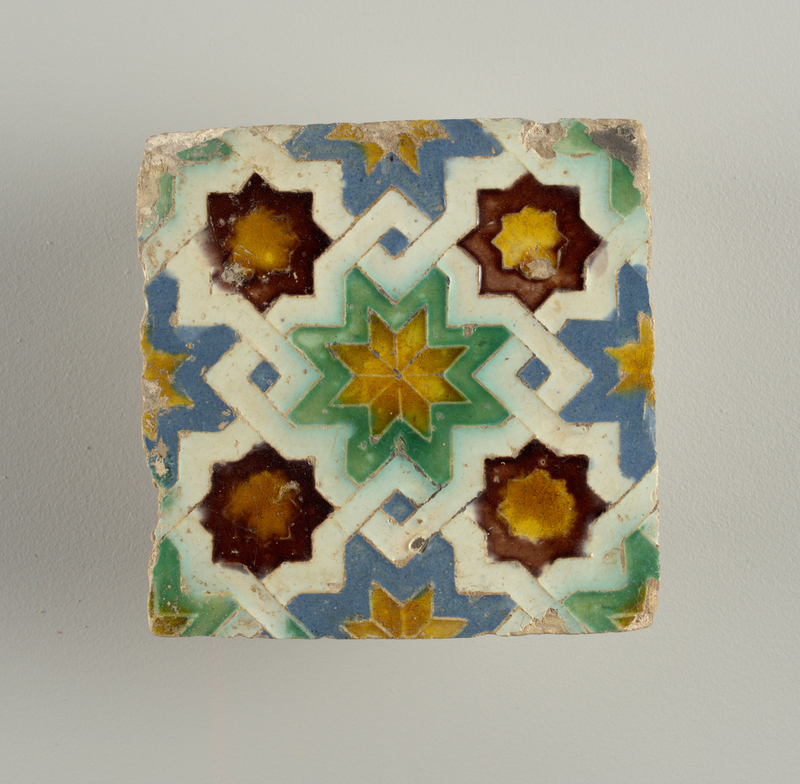 This tile would have been one of countless others used to decorate a wall or ceiling in order to create an abstract and complex geometric pattern. Geometric patterning is a key visual element of Islamic art as one of three types of non-figural decoration along with calligraphic and vegetal patterns. Although stylistically diverse, the visual complexity of all-over patterning is also seen in Spanish lustreware (referred to as Hispano-Moresque ware) and textiles from this period. This preference for all-over patterning can in part be attributed to Spanish decorative art’s intimate relationship with Islamic art and culture. In addition, this is the period when the country’s colonisation of the Americas further enriched Spain’s cultural complexity as is mirrored in both Spanish and Mexican Talavera pottery. Anthony Ray and Pip Barnard, “Sixteenth-Century Pottery,” in Spanish Pottery, 1248-1898: with a catalogue of the collection in the Victoria and Albert Museum (London: V & A Publications, 2000), 111. Catherine Acosta is a graduate student in the History of Design and Curatorial Studies program offered jointly by the Parsons School of Design and the Cooper Hewitt, Smithsonian Design Museum. She is a Fellow in the museum’s Product Design and Decorative Arts Department.